Iran president Hassan Rouhani has vowed a “crushing response” after four gunmen attacked a military parade in the city of Ahwaz, killing at least 25 people, including soldiers and civilians. The fighters opened fire on a large crowd of spectators watching the parade in the southwestern city and then attempted to attack the viewing stand for official dignitaries before being shot and wounded by security forces, the semi-official Fars news agency said. 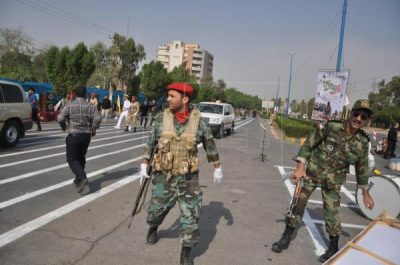 The official state news agency IRNA said 53 people had also been wounded in Saturday’s attack and that many were in a critical condition. “There are a number of non-military victims, including women and children who had come to watch the parade,” the agency quoted an unnamed official source as saying. “The response of the Islamic Republic of Iran to the smallest threat will be crushing,” Rouhani said in a statement on his official website. A video distributed to Iranian media showed soldiers at the parade, an annual event marking the start of the country’s 1980-88 war with Iraq, crawling on the ground as gunfire blazed in their direction. Russian President Vladimir Putin expressed condolences to Iran’s president following the attack, saying Moscow was ready to boost joint efforts in the fight against terrorism, Russia’s RIA news quoted the Kremlin as saying. A spokesperson for the Ahwaz National Resistance told the Reuters news agency it had undertaken the assault. Iran’s Islamic Revolutionary Guard Corps said the Ahwaz National Resistance was “likely” behind the attack. Later on Saturday, IS claimed responsibility for the attack, according to the group’s Amaq news agency. The group provided no evidence for the claim, Reuters reported. Writing on Twitter, Iran’s Foreign Minister Mohammad Javad Zarif blamed “a foreign regime” backed by the United States for the attack. An Iranian military spokesman said the gunmen were trained by two Gulf Arab states and had ties to the US and Israel. “These terrorists … were trained and organised by two … Gulf countries,” Brigadier General Abolfazl Shekarchi told the official news agency IRNA. “Enemies should not imagine that they can gain dignity with this sinister move. The Iranian people and the armed forces will respond to this,” he was quoted by IRNA as saying.Iran was holding similar parades in several cities including the capital Tehran and the port of Bandar Abbas on the Gulf. State television blamed “takfiri elements,” a reference to Sunni fighters, for the attack. Featured image is from Agencia EFE.